Having come to Hungary chiefly because I had never been to Budapest, we did finally get around to driving up to the Big City, which was an hour and a half away from our place on Lake Balaton. Since we only spent half a day there and assumed we would return (we didn’t), we decided to focus our visit thematically: we would explore Jewish Budapest. 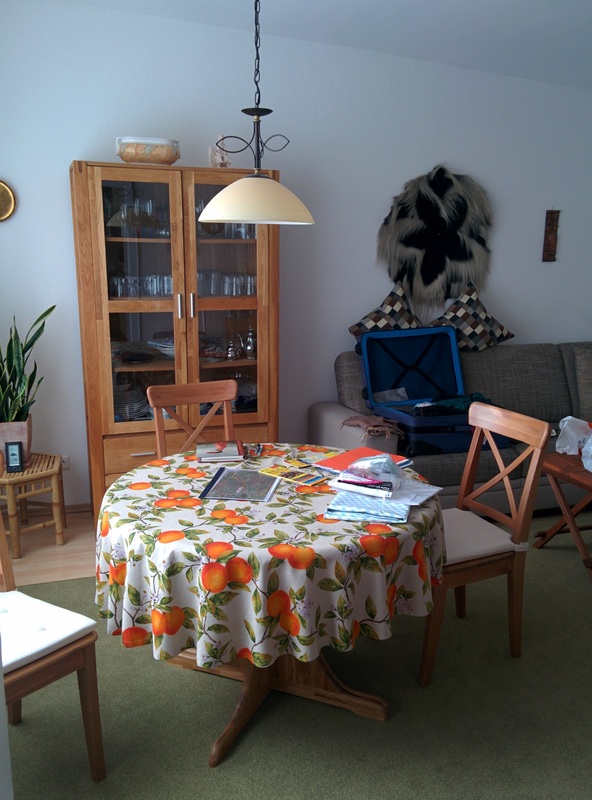 This theme is in keeping with our visits in other cities, from Berlin to Trieste. And in Budapest this focus seemed especially appropriate: before World War II, one in four Budapest residents were Jewish, and they were probably more accepted and essential to the city’s culture than in most other places in Central Europe. In the 1920s, 90% of bankers in Budapest were Jewish, 60% of the doctors, and 50% of university students. (I am not Jewish, but have a long, close relationship with many Jewish friends and have been drawn to Jewish history because of the years spent in German-speaking countries). One can learn so much about a society’s cultural mores and its history by visiting its cemeteries, so we began our explorations at the Kosmas Cemetery, opened in 1893 and one of the largest Jewish cemeteries in Europe. It lies much further out of town than we had anticipated, and driving there brought us through less than salubrious parts of the city, past lots of those unfortunate Soviet-era apartment blocks, as well as a rather intimidating prison (we were stopped in traffic while prisoners were being escorted across the street, surrounded by viciously barking German Shepherds and what seemed like about 20 guards). Not the greatest introduction to one of the most beautifully-situated cities in Europe. But the cemetery’s grounds were an inviting venue of solemn calm. The entrance is where the domed building stands, now a bit dilapidated and having lost its gilt around the dome. The gates lead into a myriad of tree-lined paths extending for great lengths in several directions, with grassy expanses filled with gravestones. Near the entrance are a number of extravagant tombs in all architectural styles: the resting places for Budapest’s leading Jewish families in the period of their most prosperous and influential presence in the city, from the 1860s through the 1920s. One of the most impressive and flamboyant tombs is that of the Schmidl family, designed in 1903 by Hungary’s leading Secession architects Ödön Lechner and Béla Lajta and using Zsolnay tiles (we’ll talk about Zsolnay again in Pecs). One gets a sense in these elaborate tombs of a competition for ostentatious display among these prominent families, even in monuments to the dead. Evidence of happy, integrated times. But then one is confronted here with the sorrowful fate of this shining world. So many of the gravestones list a death date of 1944. Most of these are memorial tombs, created to commemorate the loss of whole families in that hideous year, when under Adolf Eichmann’s direction, all the Jews of Hungary were sent to the concentration camps, or were locked up in the Budapest ghetto where they were systematically shot or died of starvation. (Hungary is the place, however, where thousands of Jews were saved from the camps by people like Raoul Wallenberg, for whom there is a memorial sculpture in the Jewish Museum.) The Kosmas Cemetery also has a Holocaust Memorial, on which, poignantly, names are still being pencilled in, as families learn more about their ancestors’ fate. On that somber note–it rained only during our time in the cemetery, and cleared up as soon as we left–we drove into Central Pest, first to visit The Great Synagogue on Dohanyi Street (“dohanyi” means tobacco in Hungarian!). This is the largest synagogue in Europe (the largest in America, Manhattan’s Central Synagogue, is a direct copy of this one), built in a Byzantine Moorish Revival style by the Viennese architect Ludwig Förster in 1854-59. As is so often the case with 19th-century historicist buildings, Förster said he chose this revival style because he thought it was most closely aligned to Levantine styles and could not identify a specifically Jewish architecture! If you look at the photo of the synagogue’s interior, you can see plaques with flags along the middle aisle. These identify where guides speaking each country’s language give explanations of the synagogue’s history. The biggest group sat in the English-language section. The grounds also include a memorial garden to the victims of the 1944 pogrom–many of whose bodies are buried here–and a stunning Holocaust memorial, a metal weeping willow with the names of victims inscribed on every leaf. (The sculpture was partly funded by Tony Curtis, who was of Hungarian background). Another of our thematic goals on this trip is to document public libraries, and in Budapest we found a doozy. The Ervin Szabó Library is housed in a 19th-century Neo-Baroque palace built by the Wenckheim family. When we arrived, we found a film crew had taken over the palace part of the building, so we were only able to enter the library section. 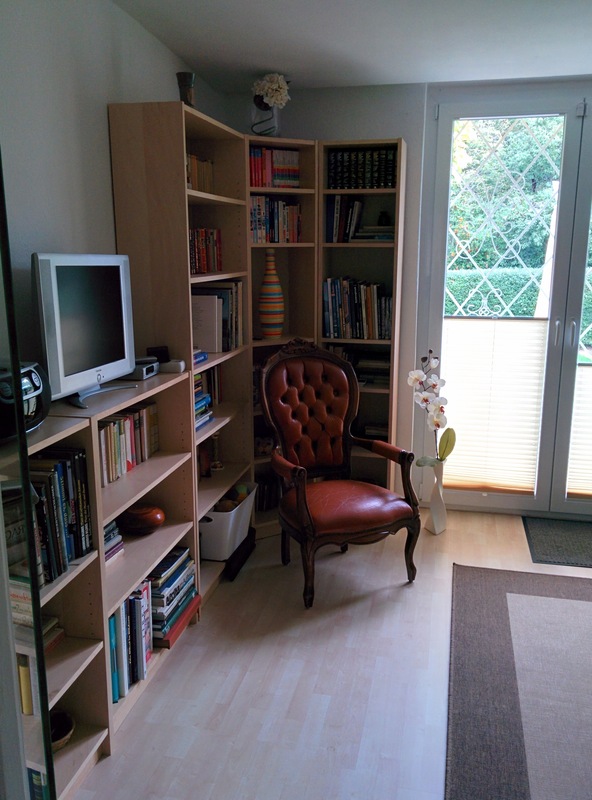 But what a public library space! One has to pay to buy a library card to enter the reading room, so we just admired the coffee shop and got information about the collections. It contains an unbelievealbe photographic archive of 120,000 images of Budapest, as well as 300,000 books and documents on the history of the city. It is located next to the university, and the place was stuffed to the gills with students. Szabó was a social reformer who served as the library’s first director. Budapest–or shall I say Pest, since we really only got to that side of town–is filled with some beautiful buildings, many of which are still in a lamentable state. Plastering is desperately needed! They reminded me of what Viennese buildings looked like in the early 60s before war damage had been completely repaired. While the city has a bit of a hipster buzz–all the young folks speak English, there are tons of pubs and night spots–it’s obvious that money is only being spent to renovate the most touristy places, which is sad. Let’s hope that progress will be made soon–it’s a shame to see these edifices falling into decay. And I am not saying they should be tarted up to gentrified levels! Just maintained a little bit. So that was our whirlwind trip to Budapest! We also were able to visit the spectacular Central Market near the river, the mighty Danube River, which, as I had always been told, looks much more like the romantic waterway of song in Budapest than it does in Vienna. Finally, as we drove past, we caught a glimpse of the phantasmagoric Museum of Applied Arts, with all those amazingly glittery Zsolnay tiles. Mention of Zsolnay leads into my next blog on Pecs; I had hoped to include that description here, but there’s so much to write, and so little time! Next blog, I promise! A little history: these garden houses originated as what became known as Schrebergaerten, after a 19th-century champion of gardens for city people Moritz Schreber. After World War II, when Germany and Austria were in ruins, little bits of open land along the railways and elsewhere were broken up into allotments so that people would have places to plant vegetables and get a little fresh air. Originally, they had little sheds and garden structures, but eventually they became more elaborate, with little houses as summer getaways. 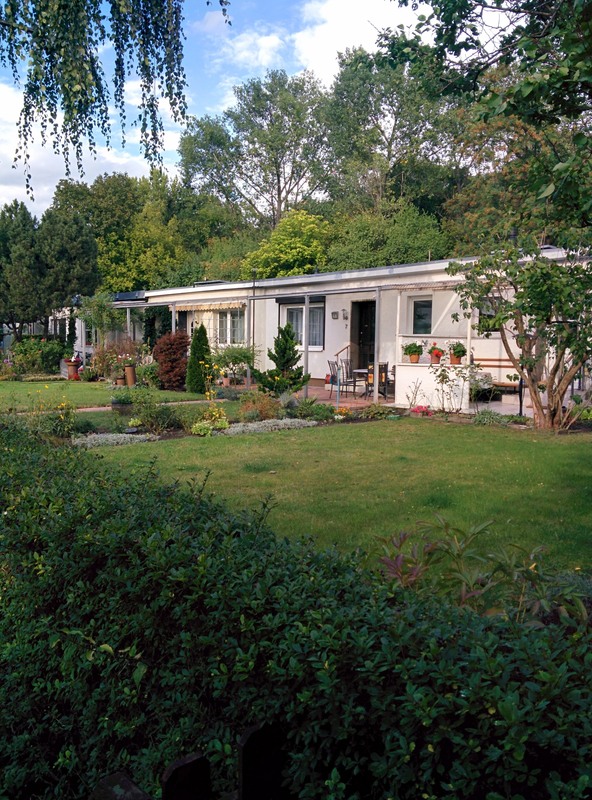 This one, and this whole garden area, must have been quite sought-after properties in the days of the DDR. 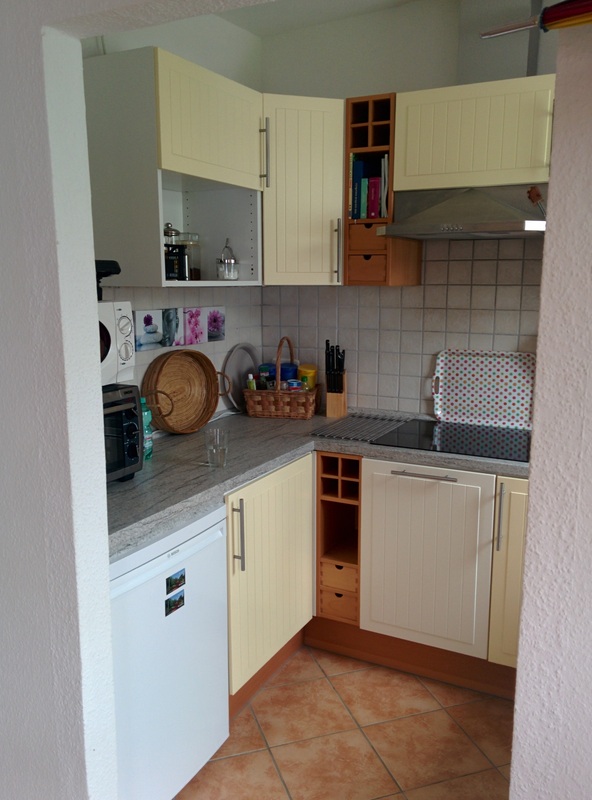 They are now completely renovated into these lovely kinds of cottages. 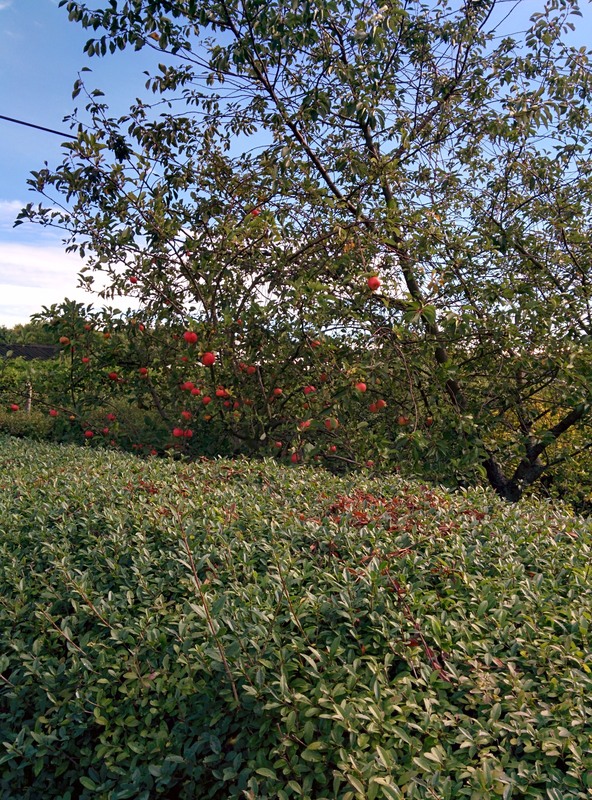 This whole area is filled with these garden properties, complete with elaborate floral displays and fruit trees. 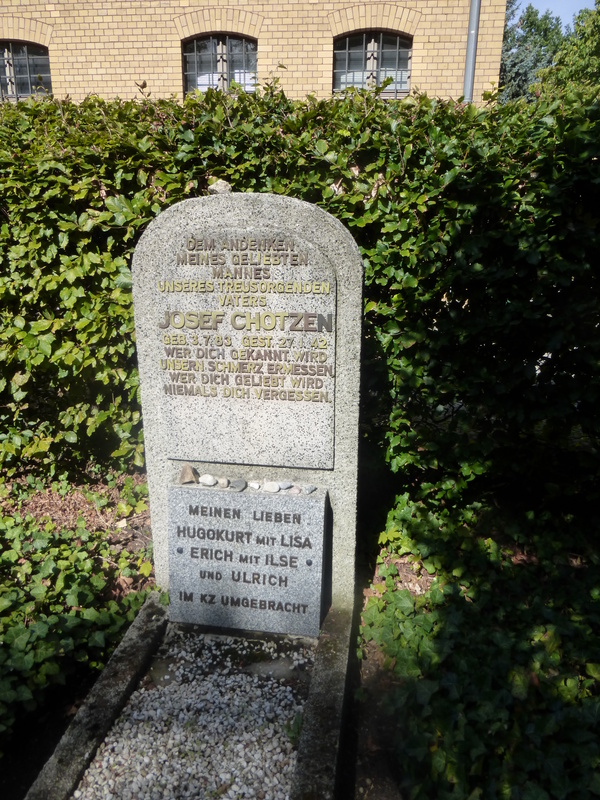 We walked along the paths between these little houses on our way to the only real historic site in this part of the East, the Juedischer Friedhof Weissensee, which I’ll talk about more in a minute. 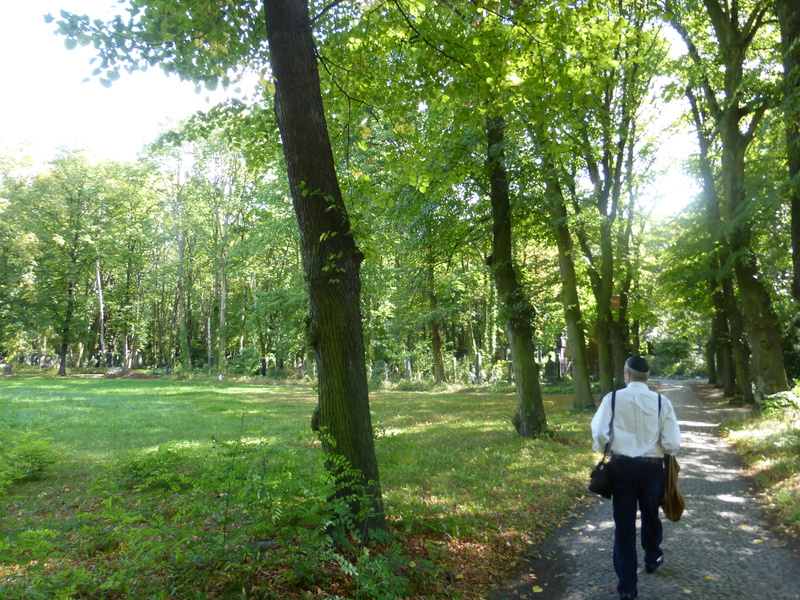 The Volkspark Prenzlauer Berg, now such a beautiful forested area, with well laid-out pathways, and hiking trails where one can walk dogs and see red squirrels and listen to the birds chirping, was before World War II a flat open field. Its height, which is now the highest point in Berlin, is the result of its origins: it came about as one of the major places where the rubble of the city after the war was dumped–that’s how much debris there was! The Germans then laid out paths, planted trees, and let nature take over. Germans find the need for fresh air and forests an essential part of life, so they turned the terrible destruction of their beautiful cities into a world of wildlife and frische Luft. 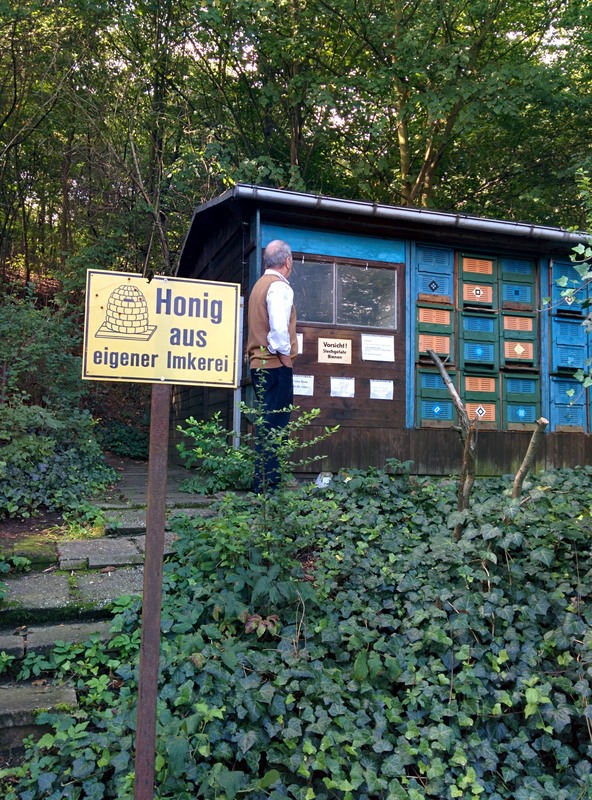 Walking through this park and along the Kleingartenanlage, we ran into something that delighted George: a communal apiary! The sign says “Honey from your own beekeeping” (I love the German word for beekeeping, Imkerei ). People have left bottles for the beekeeper, and notes about when the next honey extraction will happen. What a delightful idea, no? 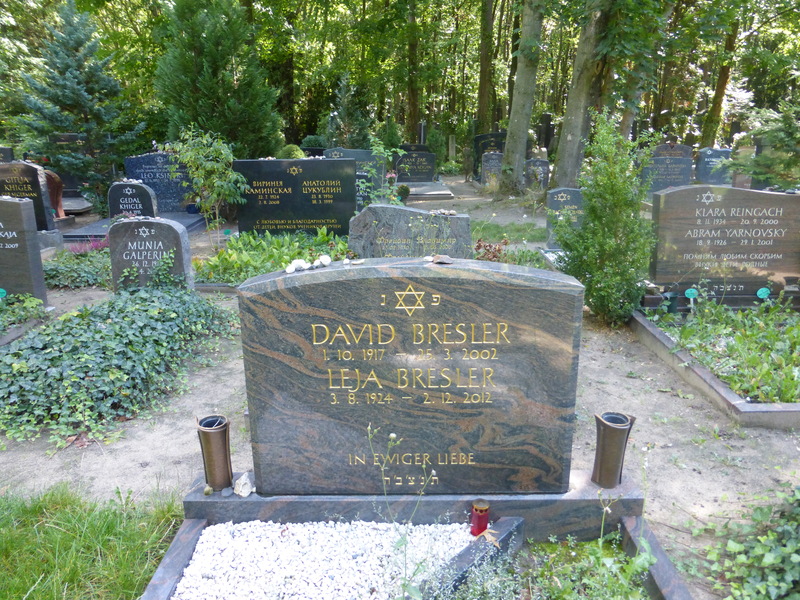 Our destination for the day was, as I said above, the Jewish Cemetery at Weissensee. Our landlord told us that this is the largest Jewish cemetery in the world, in terms of geographical size, and having walked through it all, I can believe him. 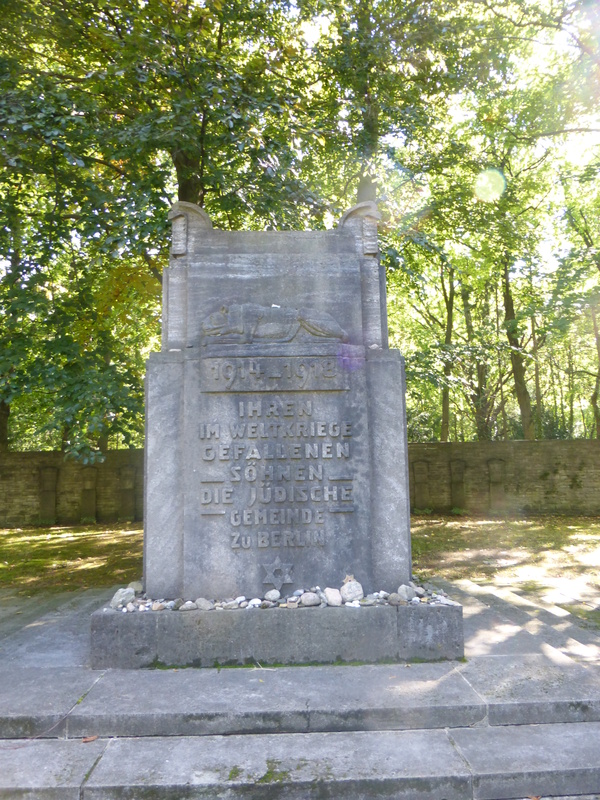 It was the third Jewish cemetery in Berlin, laid out in 1880. 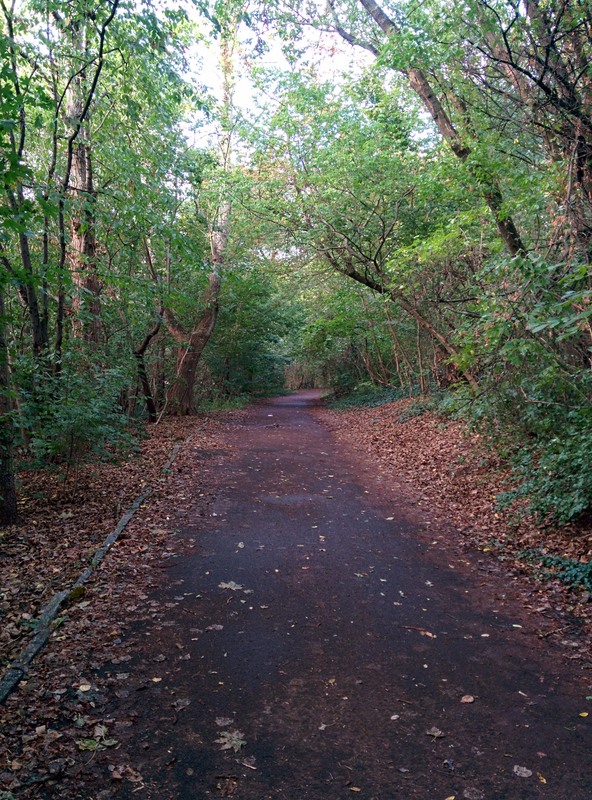 It is absolutely beautiful with its quiet and lushly forested walkways and open spaces, and it goes on forever. 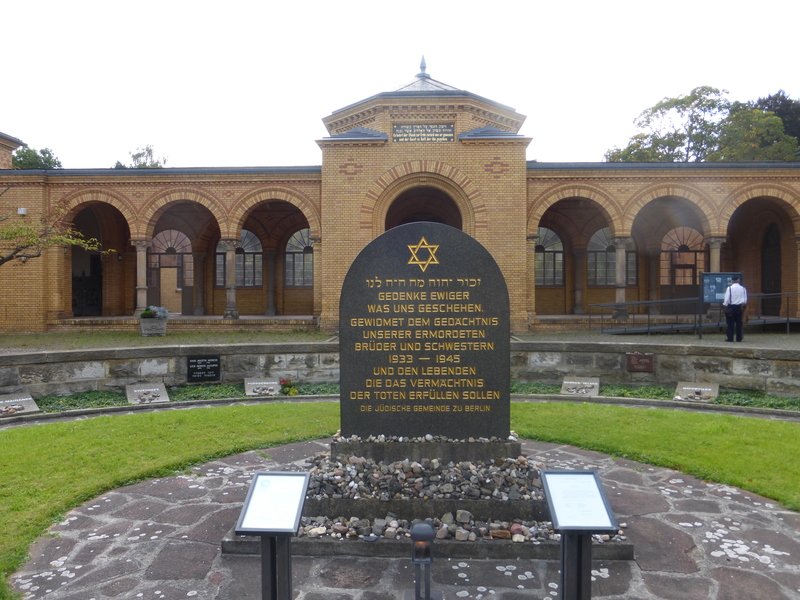 The era that it encompasses is that in which Jewish families in Berlin became prosperous and made their most significant contributions to German culture, and so the gravestones and tombs are often quite elaborate, even ostentatious. This one, surrounded by painted ironwork, was the most grandiose of all. 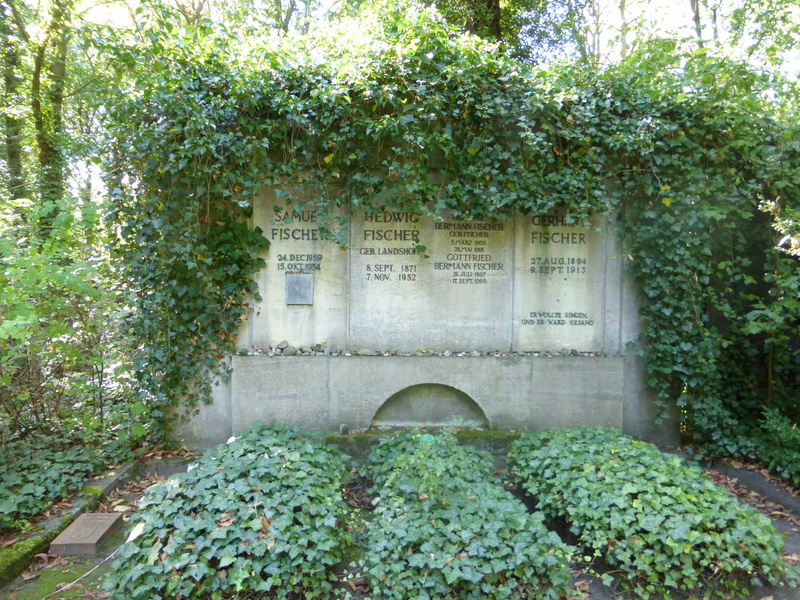 Several famous and illustrious figures are buried here, and I took the opportunity to place a stone at the grave of Samuel Fischer, the great founder of one of Germany’s most important publishing houses. The tombstone even had a small plaque showing the publishing house’s famous logo. The solemnity of the experience, of course, the utter incomprehensible poignancy, can be felt everywhere, from the special section for the Jewish Berliners who died fighting for their country in the First World War, to the heartbreaking reminders of the fate of nearly all of these families. The photo above is the entryway, which presents a memorial plaque to the victims of the Holocaust, surrounded by the names of all the concentration camps where they were murdered. And individual gravestones tell of suicides before the Nazis came, and ones honoring those family members who perished in places such as Auschwitz and Treblinka. But there was also the uplifting fact that new burials continue. Many of these tombstones were in Russian, but there were also signs that members of these old Berlin families were choosing to be buried back in Berlin. It was a moving experience, and such a gorgeous place to walk and to consider this greatest of 20th-century tragedies.